KiEV, the main positive contactor won't engage until the condenser is at pack voltage. 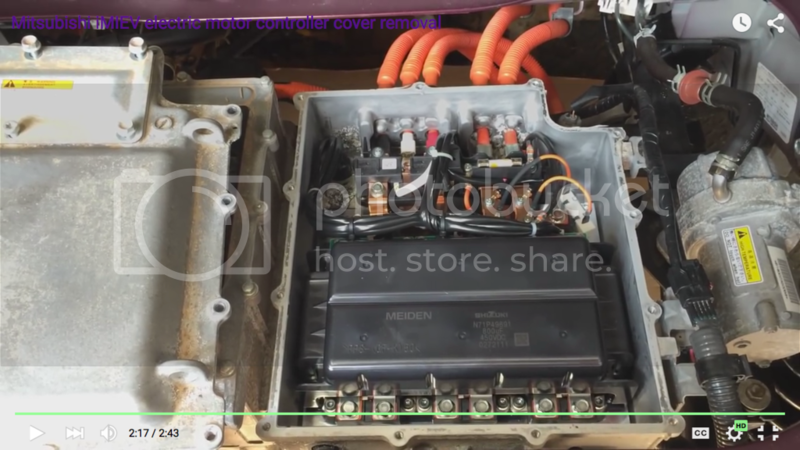 Since the condenser tops out 12 volts shy of pack voltage, the car errors and never connects the pack. It appears that the condenser discharges really quickly after the flag was set, which may point to an undesired load somewhere in the system. In my experience, I usually hear a clunk 5 seconds after powering the car off, which I believe is the negative main contactor dropping out after condenser discharge is complete. This load would cause the condenser to not charge quickly enough given a fixed current source (the pre-charge resistor), so it times out before fully charging. Lic, just to verify, is the fuse feeding the DC-DC converter blown? No. If car starts - it is working fine. It takes charge, it drives well. Hi..i think it is really odd that it blows the fuse to the inverter while charging--i wouldn't have guessed that power was applied to the inverter at that time, can't see any reason why it would be needed or desired. Last edited by PeterJohn1 on Thu Oct 25, 2018 12:59 pm, edited 1 time in total. PeterJohn1 wrote: Hi..i think it is really odd that it blows the fuse to the inverter while charging--i wouldn't have guessed that power was applied to the inverter at that time, can't see any reason why it would be needed or desired. That 20 amp fuse located in the inverter enclosure actually serves as both the charger output and the DC-DC input fuse. I got p1a15 code when i was in Chdademo charger and started fast charge.. yea it wont let car to go Ready mode.
. Just wondering how it gived 15% more soc? Do u think i might need ask maintenance just reprogram ECU to not get p1a15 active after every DTC clear? Lic which Lauch x431 u have? Lic wrote: i have hyperion 1420 charger. I tested my battery and it showed good capacity and it can provide good current without big voltage dropping, plus i measured internal resistance and it was fine (i don't remember exact numbers). so i am sure in my battery. so i looked car by launch tester and only serious error was P1A15. i erased it and car showed ready. I tried to switch it on and off several times - it was fine. i tried to make small ride and after switch off and on car showed same error again and doesn't show ready. i tried to find what is make car to show error and found that condenser charging timeout flag is on every time when car shows error P1A15. it is look like most likely car will show ready if i did car small rest before. same problem with same error when i tried to charge car. i tried to use other 12v battery from my other car and everything was the same - it is easy to get ready if i didn't use car some time and it starts to show error after even small ride. when car is show ready condenser voltage is 340v and real battery voltage is 350v. So after long time I returned to repair car. All those time car was sitting on driveway. I tried to remove error and start car but after about 30 attempts I was not able to get ready. So in summer I left car in state in which car was starting successfully time to time, but right now it does not show ready at all. Same error, same problem - condenser can't charge in right time. It is strange why car doesn't show ready at all. Big difference is only temperature between summer and this time. I think I will try to open MCU and look condenser, but I am not sure what exactly to check. Any suggestions? 12v is fine for sure. I have actually 3 around me. One of them 6 months old original mitsubishi i-miev battery. It is fully charged and checked for capacity and ability to provide good current without big voltage drop.